The Rep Welcomes Audiences to "Our Town"
The Milwaukee Rep closes its 64th season with a gorgeous production of Thornton Wilder’s classic “Our Town,” featuring an enormous cast that includes many of Milwaukee’s favorite performers. Led by the incomparable Laura Gordon as the stage manager, it is a languid and loving portrait of ordinary people living unremarkable lives, punctuated by brief and brilliant moments of connection. The truth is Grover’s Corners, New Hampshire, is nothing like our town. The sleepy little New England village exists more than a century in the past and its 3,000 or so people live in a world of milk men, horses and buggies, soda fountains, doctors who make house calls, and neighbors who don’t lock their doors at night. It is small and rural; quaint and predictable. Many of its citizens are born, marry, have families, and die without ever venturing further than the city limits. This, in part, explains the evergreen appeal of the Pulitzer Prize-winning play, which has enjoyed nearly continuous productions since its premiere in 1938. Of course the large cast and Wilder’s demand for a hyper-minimal set that will not get in the way of the story has also made it a favorite of community theaters and high school drama departments. It’s a good guess that many of those productions never got underneath the play’s folksy charm to expose the playwright’s plea for being fully present, alive, and connected to our fellow travelers, even in the most mundane and ordinary days. Rest assured that this production does. 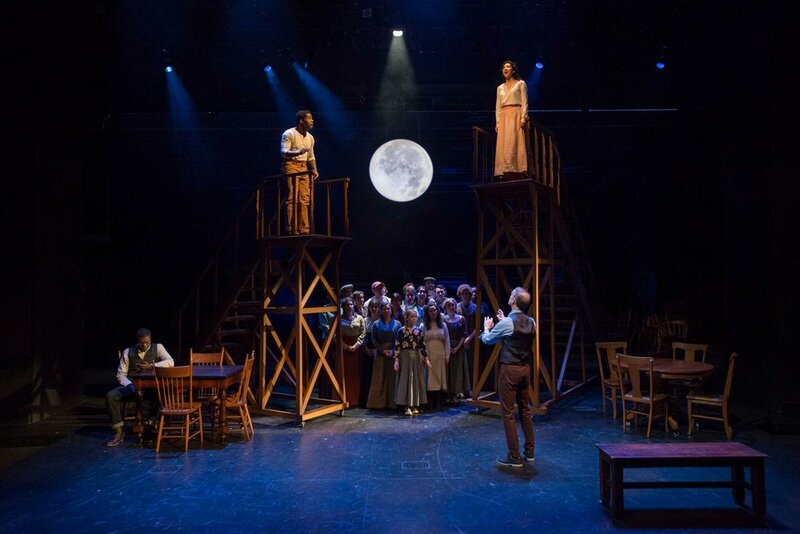 Directed with care and precision by the Rep’s Associate Artistic Director, Brent Hazelton, there are several key elements of this “Our Town,” that contribute to its success and set it apart from the others. · Laura Gordon. Marking her 25th season at the Rep, Gordon is sublime as the stage manager. Absolutely essential to the success of the show, the stage manager leads the audience on this journey, from the moment she removes the ghost light from the stage, to the final bows. With the warm, conversational style of a favorite professor and a deep love for her town and its funny, flawed inhabitants that exceeds even the proudest mayor, she shows us all of Grover’s Corners’ best parts, from the sunrise over the mountains to the smell of heliotrope on a hot summer night under a full moon. She also shows us how small we all are, what minute pieces of history we inhabit in the earth’s timeline, and how we squander our time, ignoring some of life’s most important moments. · A deep bench. There are a lot of roles in “Our Town,” but there are only a few large parts. The rest are carefully wrought background figures who have only a few lines, but can add gorgeous specificity and texture to the community as a whole. So it seemed like an injustice to waste the considerable talents of actors like Jonathan Wainwright, Carrie Hitchcock, James Pickering, and Jonathan Smoots in tiny cameos. But it is also luxurious. Just as musicals are judged by the weakest member of the chorus, large ensemble shows often stumble when mediocre actors are put in the bit parts. Not so here. Everyone who speaks onstage has a backstory and intention. They fill their few lines just as they fill the silences. They are glorious. · Stunning leads. Chiké Johnson and Elizabeth Ledo are transcendent heartbreaking as Dr. and Mrs. Gibbs. One can easily imagine the doctor retracing the steps of Union soldiers over Civil War battlefields each summer on vacation, while Mrs. Gibbs longs to hear the music of French conversation in a Parisian café. Likewise DiMonte Henning and Cher Desiree Alvarez are divine as the pair of sweethearts George and Emily. From their fumbling first steps as teens grappling with love to their excitement-turned-panic in the moments before their wedding, each emotion is right-sized and real. · Thoughtful design. Just as the stage manager talks about generations of people occupying the land where Grover’s Corners now stands, over thousands of years, there is a visual sense of accumulation on stage. Behind two dining room tables that serve as the main set pieces, there are dozens of wooden chairs of different styles, piled and stacked on top of one another. Built, used and discarded, they remain a pale monument to their past owners. They surround miniature buildings that light from within as night falls, creating a dreamy, faraway landscape. Scott Davis’s mostly bare set does use a variation of the ladders where George and Emily customarily stare at each other from their bedroom windows. These are sturdy wooden staircases on wheels that rise up to two stories in the air. 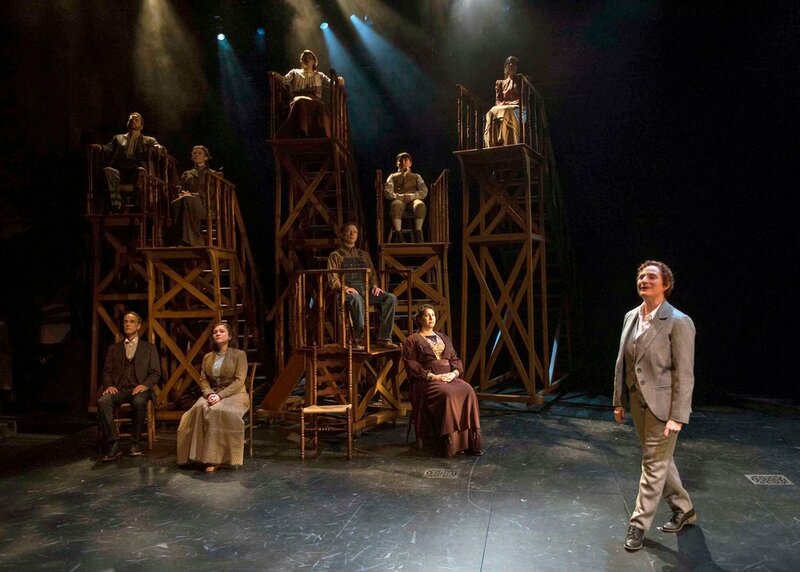 As we begin the play’s third act, in a cemetery, the staircases multiply until they are filling much of the stage. Those who have passed on sit stock still at varying heights, looking down on the misguided living people who come to visit. It’s a genius conceit, communicating the accumulated souls of generations. · God is in the details. From the luminous full moon that rises at the end of act 1, to Jim Ridge’s slightly slurred speech and faltering steps as the town drunk, to the layers of period clothing that are added to each actor’s costume as the play progresses, the thoughtful details in the production are exquisite. A quiet line played for an unexpected laugh. A missed entrance by one of the “players.” The meticulous miming of fixing breakfast with subtle sound effects to accompany each squeaking pump handle or banging screen door. These fine points lift the play from good storytelling to utter magic. Why go? It’s a beautiful rendition of a classic, with outstanding performances from Laura Gordon, DiMonte Henning, Cher Desiree Alvererz, and many more of your favorite Milwaukee actors.